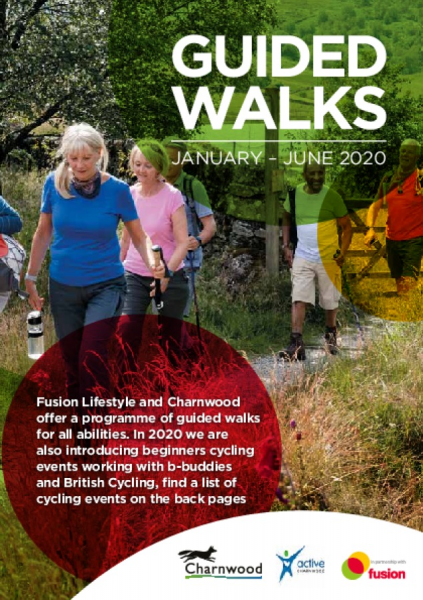 The Guided Walks programme is organised by Fusion Lifestyle in partnership with Charnwood Borough Council. The programme consists of volunteer led walks for a wide range of abilities in and around Charnwood. The brochure includes shorter Walking for Health walks, longer 'progression' walks, accessible walks, Nordic Walks and more. The majority of walks are led by a team of fantastic, friendly trained volunteer walk leaders. Most walks are free to attend, with the exception being our 'Coach trip walks', which take you out of the Borough by coach to explore areas such as the Peak District for the day, where the charge covers the cost of coach hire. The programme is also supported by partners including Loughborough Ramblers, Charnwood Action Group and Walking for Health. A pdf copy of the brochure is available to view online and download below. We have a limited supply of hard copies of the brochure, if you'd like to request one please contact us.